SharePoint offers a tremendous array of options for improving performance and efficiency of collaborative portal applications. Understanding the inner workings of the framework and its dependencies upon key infrastructure components, including servers, network connections, services, operating system components and databases, is vital to the success of any optimization strategy. Implementing basic performance enhancements as outlined in this paper can provide tremendous improvements to the operation and performance of SharePoint within the enterprise. 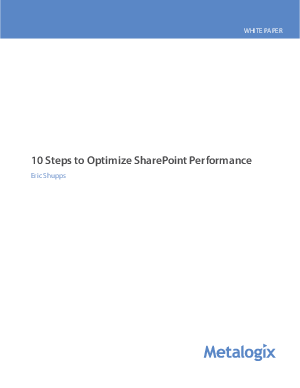 Download this white paper to follow Microsoft SharePoint MVP Eric Shupp’s step-by-step guide.